Polygons can also be created in the Arbline View. However, if the arbline bends at any point included in the polygon, the polygon will also bend. 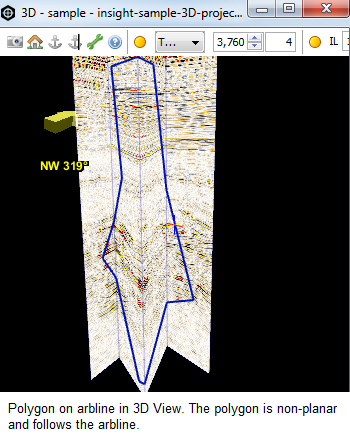 The result is a 2.5-dimension polygon and samples that fall on the surface of it will be used by Insight (e.g. in the creation of crossplots). As a prerequisite, an arbline is required to create a polygon in the Arbline View. Draw an arbline as described in Creating an Arbline. In the Control Panel, go to the View menu and open the Arbline View. 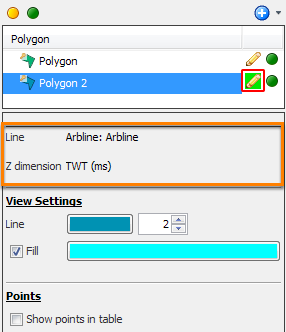 Identify the area of events on the arbline that you want to create your polygon. Create a polygon as explained in Creating a Polygon. At the polygon item row, click the Pick polygon pencil icon to enable the picking mode. This icon will be disabled if you are not the owner of the polygon (see Multi-user Considerations). 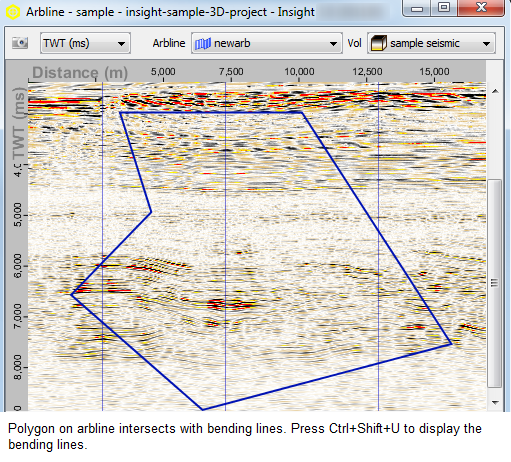 In the Arbline View, make sure you are at the arbline that you wish to create the polygon. Change the arbline by selecting from the navigation bar in the Arbline View. Click to define the perimeter of the polygon. Right-click to finish picking. Right-click an existing point to delete it. To move a polygon, press Shift and click inside the shape to drag it to a new location. To add a new point from the point you have just moved, continue to click at another location to place the new polygon point. Right click while picking to end a segment. To add a new shape to the existing polygon product, click at a new location and begin picking. To exit the picking mode, click the Pick polygon pencil icon. Alternatively, you can double-click or press Esc to disable polygon picking in the Arbline View. At any time during your session, you can edit or delete polygon points or shapes by enabling picking mode or by changing the coordinates in the Details Panel (see Editing a Polygon). The following are examples of a polygon drawn on an arbline in the Arbline View and 3D View. How do I create a custom coordinate reference system (CRS)? How to manually install Petrel Link?